Leslie Cochran, former Youngstown State University president from 1992 to 2000, spends his years in retirement writing fiction novels. Genres include mystery, crime, romance, history and mafia. Most recently, Leslie Cochran released a new series entitled the “Detroit Thorn Birds,” which is a historical fiction on the Detroit Mafia through the 1970s and the 1980s. He said from the time he was president at YSU to becoming an author, there was a little in between. Leslie Cochran said his friend continued to persuade him to write, and he ended up writing fiction novels. He said he wrote his first piece of fiction in 2011. 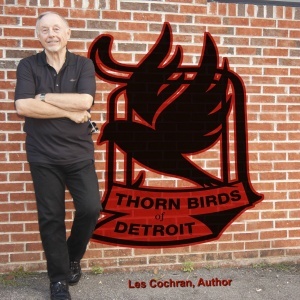 Leslie Cochran said he just started writing about the Detroit mafia because he lived in Detroit when he was doing his doctorate dissertation and teaching high school. He said those experiences gave him insights into the mafia. Leslie Cochran said a lot of people think Detroit collapsed after the riots in 1967, but there were a lot of people there trying to save their neighborhoods. He said as a teacher, he got to know some of these people and that is the genesis of the books he’s written. Leslie Cochran said the characters in his books become a part of him. He said when he starts writing, he starts about 5:30 a.m. or 6 a.m. until about 10:30 a.m. to 11 a.m.
Leslie Cochran said his mother used to say ‘if it comes easy, it isn’t worth doing.’ He said if you’re going to do it, then you have to do it right when it comes to being a writer. Lin Cochran, the wife and marketing personnel for her husband Leslie, said she is glad that her husband is doing this, and that it keeps him busy and his mind working. She said previously, in his retirement, she said he ran for political offices more than once, and she likes this a lot better.